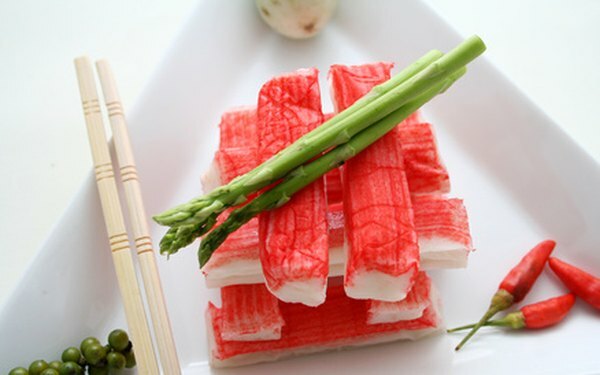 Imitation crab, also commonly called surimi or kanikama, is a mild-tasting product formed and colored to mimic the look of crab legs. It is predominantly made using Alaskan pollock, a white fish, but other types of fish including mackerel, barracuda, blue whiting and cod, find use in the production of imitation crab. You may use imitation crab in a variety of ways -- from sushi to salads to casseroles. This healthy food contains a range of vitamins and minerals. A 3-ounce serving of imitation crab has 86 calories. If you follow a 2,000 calories meal plan, the calories in a serving of this seafood accounts for 4.3 percent of the amount you should consume every day. One serving of imitation crab contains 1.1 grams of fat, or 12 percent of the total calories. The amount of fat in imitation crab does not comprise much of the recommended daily limit, which is 44 to 78 grams or 20 to 35 percent of the calories in your daily meal plan. Despite being fake crab, imitation crab meat comes from real fish, and this makes the protein it contains – 10.2 grams per serving – the type that provides all essential amino acids, referred to as complete, high quality protein. You will need more than one serving of imitation crab to meet your daily protein needs, which is 46 grams per day, but may vary according to your lifestyle and nutritional goals. Carbohydrate needs may differ from person-to-person as well, but the general recommendation stands at 130 grams per day. One serving of imitation crab provides 8.7 grams of carbs. Imitation crab serves as an good source of vitamin B-12; one serving provides 23 percent of the daily value for this vitamin. A serving of imitation crab also provides 24 percent of the daily value for phosphorus and 9 percent of the daily value for magnesium. Eat a serving of imitation crab, and you take in 714.8 milligrams of sodium. Average sodium limits range from 1,500 milligrams to 2,300 milligrams, although you likely consume sodium far above this level; the U.S. Centers for Disease Control and Prevention reports that most Americans eat over 3,500 milligrams per day. When including imitation crab in your diet, monitor your meal plan to ensure you do not consume sodium at these dangerous levels.